The seats are made of quality plywood which is available in 10 colours of your choice. The wooden covers of the bench external armsets are dyed in the colour chosen by you to match the seat. The bench is based on a metal framework in two colours of your choice – alu (light gray) and black. Both framework colours available for this model are also included in the model price list. 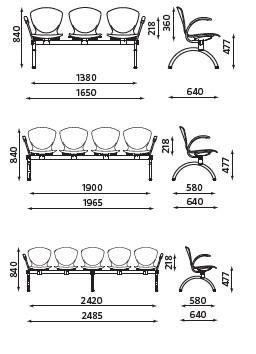 You can also order a 2-seater bench with an extra table between the seats .